Product #15719 | SKU P-UCA360 | 0.0 (no ratings yet) Thanks for your rating! The UltraClamp 360 allows 360° panning for a camera or other devices that can be solidly attached to a rolled down car window, bicycle handlebar, picnic table, or other similar object. Strong enough to support most cameras, spotting scopes, and camcorders, the UltraClamp 360 attaches to round or flat objects from 0 – 3.8 cm thick. The easy to use 360° panning function allows you to easily take video or photos of a bike race, your child's soccer game, and skyline or nature shots. 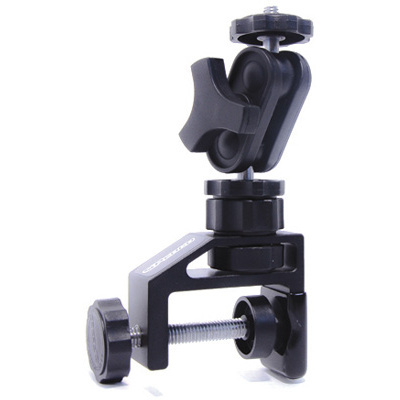 Durable aluminum clamp body and screw. Attaches to round or flat objects up to 0 – 3.8 cm thick.